Dr Bob Woods, medical specialist and former member of the House of Representatives, was appointed to a casual vacancy in the Senate in March 1994. As he was a senator for less than three years, he was not able to reach his full potential in the Senate, although he was a capable minister in the Howard Government. Robert Leslie Woods was born in Walthamstow, London on 13 April 1947, the son of Percy Woods, a printer's cutter, and his wife Mary, née Wright. He attended Enfield Grammar School in London between 1959 and 1965, then studied medicine at Charing Cross Hospital School at the University of London. He graduated MB BS in 1970, became a Member of the Royal College of Physicians in 1974, and during 1976 and 1977 was a resident physician at the Royal Post-Graduate Medical School in London. The death of his first wife from leukaemia prompted him to specialise in the treatment of cancer. Woods came to Sydney in 1977 to help set up the Ludwig Institute for Cancer Research at the Royal Prince Alfred Hospital. He was also a founder of the Cancer Treatment Centre at Concord Hospital, and from 1980 he was a Senior Staff Specialist at the Royal North Shore Hospital in Sydney. Regarded as a leading Sydney cancer specialist, Dr Woods became a Fellow of the Royal Australasian College of Physicians in 1979, and was chairman of the Australian Medical Oncology Group (1986–87). On 13 June 1986 Woods married Dr Jane Carrick, a gastroenterologist. They had two children; Woods also had a son from a previous long-term relationship. Carrick was a daughter of Sir John Carrick, General Secretary of the NSW Liberal Party for 23 years, a senator (1971–87) and a minister in the Fraser Government. Carrick was a mentor and close friend of Prime Minister John Howard, and the Carrick family provided Woods with powerful right-wing Liberal Party connections and assisted his ambitions for a political career. Woods joined the Burwood branch of the Liberal Party, nominated for the House of Representatives seat of Lowe, and campaigned assiduously for preselection, which he won in September 1986. 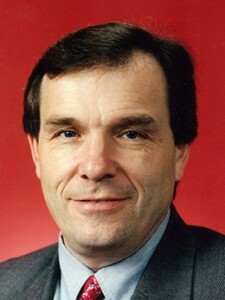 In the federal election of July 1987, at which the Labor Party increased its majority in the House of Representatives, Woods achieved a swing of 3.8 per cent to win the seat from the sitting Labor member, Michael Maher. He successfully contested the seat again in 1990, narrowly defeating the ALP's Mary Easson. In these contests for Lowe, a marginal seat, Woods showed himself a tough election campaigner. In the last days before the 1990 election Woods direct-mailed the electorate with a story that Labor was planning to set up a multi-function-polis to house thousands of Japanese people in the electorate. This stratagem earned him the name 'Tokyo Bob' from members of the Labor Party, who claimed that he was playing on racial prejudices; they were still expressing their outrage years later. Woods immediately took an active role in the federal parliamentary Liberal Party, becoming chairman of the Liberal Party family, social and health policy group. Soon after taking his seat he was appointed to the House of Representatives Standing Committee on Employment, Education and Training, and participated in a subcommittee that reported on year twelve retention rates. Woods maintained an interest in pre-tertiary education throughout his parliamentary career. In a period in which the Hawke Government was redefining the public health framework in Australia, Woods found plenty of opportunity to speak in the House of Representatives. Articulate, and well-informed on health issues, he was scathing about the government's implementation of universal health insurance, and its management of doctors and hospitals, nursing homes, and the administration of drugs. A champion of the private medical sector, he reiterated that Labor's health system was destructive of quality in health care, and those most disadvantaged were the poor, the aged and the disabled. He was rewarded in April 1990 by appointment to the Opposition front bench as shadow minister for health. At the election of March 1993 Woods was comprehensively beaten for Lowe by Mary Easson, who achieved a five per cent swing. Easson claimed that Woods suffered a backlash over Medicare, as he had become associated with the idea that a Liberal Government would dismantle it. Following his defeat, Woods became a medical adviser for the Moran Health Care Group, which owned a large portfolio of health and aged care facilities in Australia and South-East Asia. Essentially, my beliefs are those of the Liberal Party. They are that we believe in the supremacy of the individual. We do not believe in collectives ... We believe in smaller government, in getting government off the backs of individuals and businesses, in less power to the government. During his first two years in the Senate, Woods attacked the Labor government's health program in Senate committees. In May 1994 he warned committee witnesses that 'one of the problems you have is that I now have more time, not having a marginal seat and things like a shadow ministry, to actually read some of the medical journals'. In the Senate chamber in March 1995, often referring to his experience as a practising doctor, Woods poured scorn on the government's plans to shore up Medicare and reduce hospital waiting lists by forcing people into private health insurance (the Health Insurance (Private Health Insurance Reform) Amendment Bill 1994), claiming it would 'make the system worse'. He was adamantly opposed to smoking, 'the biggest public health problem in Australia today', and he frequently raised anti-smoking issues in the Senate and in committees. Woods had expressed his opposition to abortion in the House of Representatives during debate on public funding for abortion on 26 October 1989, saying 'We ... believe that life begins at conception and that abortion is nothing but the wilful destruction of life'. In estimates committees in May 1994 and November 1995 he combined with Independent Senator Brian Harradine (Tas.) to cross-examine witnesses about the use of termination of pregnancy drugs such as RU486. He also opposed medical research using human embryos, and legislating to legalise euthanasia, saying 'the great danger in legislating in favour of euthanasia is that laws that permit the taking of life have the potential for abuse'. He formed a close relationship with Harradine, who praised his 'wonderfully agile and brilliant mind'. Harradine also referred to the rapid-fire delivery of Wood's speeches, in contrast to the slowness of his own delivery. While his major focus was on health, Woods contributed to debate on a range of other issues, including public finance, and foreign affairs and defence. As chair of the Foreign Affairs, Defence and Trade References Committee he presided over several inquiries, including an inquiry into the crash of RAAF Nomad Aircraft A18–401 on 12 March 1990, and the inquiry into Australia-China relations (1994–96). Woods expressed a warm patriotism for Australia, his adopted country, and occasionally spoke in the Senate on issues such as the commemoration of war anniversaries. In June 1994 he spoke fervently against Australia becoming a republic. At the federal election of March 1996, which saw the Coalition win office, Woods was the first Senate candidate elected for NSW, achieving a notable quota and a half before the distribution of preferences. Party colleagues later acknowledged his role in the 1996 federal election campaign 'which helped turn the tide against Labor and saw a record win ... in New South Wales'. There was speculation that he would be made Minister for Health in the new government, but Howard appointed him Parliamentary Secretary to the Minister for Health and Family Services, Michael Wooldridge. In representing the minister in the Senate, Woods found himself sponsoring policies that he had attacked only months before; the Coalition had made a commitment during the election campaign to retain Medicare. He worked energetically in those areas for which he had particular responsibility, including food regulation, the Therapeutic Goods Administration, and services for the deaf. At this time he formally severed his employment with Moran, which had continued as a consultancy after 1994. Recognised within the party as an effective campaigner, Woods chaired the Liberal Party's Key Seats Committee which attempted to invigorate campaigns in marginal seats. Following a by-election for the seat of Lindsay, NSW, in 1996 the ALP lodged a complaint with the Australian Electoral Commission, alleging that Woods had breached section 326 of the Electoral Act by attempting to persuade the Shooters Party to give preferences to the Liberal candidate by exaggerating Labor plans for the banning of firearms, and offering to reprint their how-to-vote leaflets. The complaint was not pursued for lack of evidence, but this, too, earned Woods particular animosity from the Labor Party. Seemingly out of the blue, on 4 February 1997 Woods announced his resignation from the ministry and his forthcoming resignation of his Senate seat, giving as his reason the desire to spend more time with his family. Within hours, the press reported that he was being investigated by the federal police for misuse of parliamentary allowances. When questioned on Channel 9's A Current Affair about the police investigation, Prime Minister John Howard said that he had first heard of the allegations on 21 January, when Woods informed him that police were conducting searches of his offices and home. Howard later admitted after questioning in the House of Representatives that he been advised of the investigation some five months earlier but had forgotten. The story became more sensational when it was revealed that a Liberal Party staff member had applied to take out an apprehended violence order (later withdrawn) against Woods. The staffer subsequently revealed that she had travelled overseas at government expense with Woods in place of his wife. Woods and his family were subjected to a barrage of media attention. A photographer from the Sydney Telegraph Mirror took photographs over a fence with a telephoto lens of Woods and his wife, with whom he was attempting to reconcile, in serious conversation in the garden of their home. The photographs, published on the front pages of News Ltd newspapers throughout Australia, provoked outrage at the invasion of privacy and raised ongoing questions about media ethics. Woods resigned his seat on 7 March 1997. Valedictories on his last day in the Senate were gentle enough, most speakers expressing regret and the hope that he could sort out his personal life. Senator Ellison, who replaced him in the ministry, outlined his achievements in his short time as parliamentary secretary, including overseeing 'the greatest reform of our nation's food hygiene laws ever'. Woods spoke wistfully about health projects he had been working on that were 'about to burst into flower'. Woods was charged under the Crimes Act 1914 with forty-one counts of fraud in April 1997 and tried in June 1999 by the Supreme Court of the ACT. He pleaded guilty to six counts of imposing on the Commonwealth, received a suspended sentence of eighteen months imprisonment and a fine of five thousand dollars and was ordered to pay reparation to the Commonwealth of $10 708. In sentencing, the judge took into consideration a plea that Woods was suffering from depression and bulimia. After leaving Parliament Woods was employed for a period as a consultant for the Macquarie Heath Corporation. From 2001 he directed the Healthwoods Group, a private medical centre supplying clinical services and aged care support. He and his wife continued as registered medical practitioners in Sydney. Candidate Profile, Liberal Party of Australia, 1990, 1993; SMH, 22 July 1990, p. 15. Norman Abjorensen, John Hewson: A Biography, Lothian, Melb., 1993, pp. 102–3; Age (Melb. ), 1 Aug. 1987, p. 6; CPD (R), 10 Oct. 1990, p. 2544; SMH, 22 March 1990, p. 6, 27 April 1990, p. 9, 11 Oct. 1990, p. 6, 5 March 1993, p. 6. Stephen Duckett, 'Making a difference in health care', in Susan Ryan & Troy Bramston (eds) The Hawke Government: A Critical Retrospective, Pluto Press, North Melb., 2003, pp. 215–24; CPD (R), 21 Oct. 1987, p. 1254, 7 Dec. 1987, pp. 2865–7, 8 Dec. 1987, p. 2998, 26 May, 1988, p. 3130, 19 Oct. 1988, p. 1862, 6 March 1989, p. 481, 21 Nov. 1989, p. 2604; Mary Easson, 'Swing High, Win Lowe.' The Sydney Papers, Vol. 6, Summer 1994, pp. 75–83. CPD, 23 March 1994, pp. 2091–8. Transcript, Community Affairs Legislation Committee, 16 Feb. 1995, 16, 26 May 1995, 5 June 1995, 23 Nov. 1995; Transcript, Estimates Committee C, 24, 25 May 1994, 21 June 1994; CPD, 18 Oct. 1994, p. 1964. CPD, 8 May 1996, pp. 568, 577, 13 Dec. 1996, p. 7597, 6 March 1997, pp. 1515–19; George R. Palmer & Stephanie D. Short, Health Care & Public Policy, 3rd ed., Macmillan, South Yarra, Vic., 2000, pp. 76–80, Sunday Telegraph (Syd. ), 17 March 1996, p. 30; SMH, 15 Dec. 1989, p. 13, 19 Oct 1996, p. 4; Media Release, Australian Electoral Commission, 29 Nov. 2000. CT, 4 Feb. 1997, p. 2; Age (Melb. ), 5 Feb. 1997, pp. 1, 2; CPD (R), 6 Feb. 1997, pp. 341, 353, 366, 10 Feb. 1997, pp. 468, 470, 475; Australian (Syd. ), 8 Feb. 1997, p. 2; SMH, 6 Feb. 1997, p. 2, 8 Feb. 1997, p. 43; WA (Perth), 8 Feb. 1997, p. 26; Australian Press Council, Adjudication No. 916  APC 17; CPD, 6 March 1997, pp. 1511–17; R v Robert Leslie Woods  ACTSC 60. This biography was first published in The Biographical Dictionary of the Australian Senate, Vol. 4, 1983-2002, Department of the Senate, Canberra, 2017, pp. 124-127.